What happens when architecture and interaction design collide to create everyday performance? Playing to the individual and to crowds, and changing the performative repertoire in real-time can manifest itself through a diverse palette of kinetic, animated, time-based and sometimes smart materials. We can choreograph real and imagined spaces. This choreography is explored through different mechanisms – wireframing, storyboarding and real world prototyping – and plays back through accidental and inferred interaction between humans and machines. To what use can we put architecture that entertains; are there sub narratives or is this about creating purely environmental spectacle? 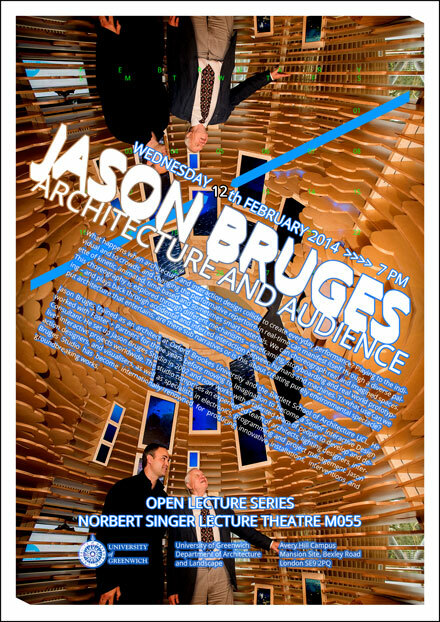 Jason Bruges trained as an architect at Oxford Brookes University and the Bartlett School of Architecture UCL. He worked with Foster + Partners for three years before moving to Imagination to become a Senior Interactive Design Consultant. He set up Jason Bruges Studio in 2002 and now works with a talented team of people to develop and deliver interactive projects worldwide. The studio comprises an experienced team of architects, lighting designers, interaction designers, and visualisers, as well as specialists in electronics, programming and project management. Jason Bruges Studio has become internationally renowned for producing innovative installations, interventions and groundbreaking works.